Grzegorz Tabasz uczy licealistów nauk przyrodniczych i ekologii, biorąc ich na zewnątrz i łącząc to czego uczą się z książek, z tym, co obserwują w przyrodzie. Jego podejście zmienia wzór w polskim systemie edukacji, gdzie tradycyjnie wiedza przyswajana jest w ławkach przodem do tablicy. Poland’s education system focuses on teaching the sciences in an abstract manner; students may successfully memorize large amounts of information, but it is a theoretical learning experience. Rather than stimulating a love for the subject, this method promotes boredom and lethargy among school-age children and also leads to frustration and indifference among educators. It might be said, with a wry note, that this problem is of more than academic interest: it contributes to the generally low interest in the environment in the society at large (though many Poles are habitual hikers and there is a cadre of environmental activists) and particularly in protection of endangered species. Poland is faced with a variety of ecological/environmental problems including declining forest cover and declining water table levels, due mainly to the poor quality of conservation efforts and industrial management. As a result, significant numbers of indigenous animals are now in danger of extinction, particularly many of the small reptiles found in Poland. As water levels continue to decrease and forest cover declines, many of these animals are finding it increasingly difficult to locate suitable breeding grounds to lay their eggs or raise their young. Moreover, once hatched the young are faced with a variety of obstacles during the early and critical stages in their development–such as surviving on heavily cultivated and processed farm land and crossing heavily traveled roadways to reach water sources. 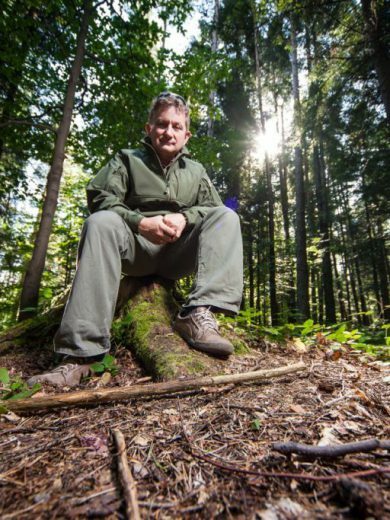 Grzegorz Tabasz is teaching high school students about science and ecology by taking them outside their classrooms and connecting what they learn from books with what they observe in nature. His approach is a pattern change in the Polish education system, where traditionally the sciences have been taught theoretically and always in a classroom setting.Grzegorz’s idea provides students with the opportunity to immediately observe the implications and results of lessons they are learning in the classroom, thus building an interest in the sciences and their wider application in the world around them. Their teachers, who may have lost enthusiasm over years of traditional lessons, are also revitalized. And Grzegorz has added an extra twist to his outdoor studies: he focuses the students’ attention on endangered species in their area and engages them in concrete actions aimed at their protection. This provides Polish youths with positive activities on which to spend their time and also contributes to the protection of Polish wildlife. Pełen profil z 1997 można przeczytać tutaj.